The easiest thing to do with a partial capo is to just clamp the top 5 strings at the 2nd fret. All it changes is what happens on your bass E string. When you play a D chord, it sounds an E, and you get to play the open bass E (which works like Dropped D tuning.) But when you play a G chord, you play normally, basically forget the capo is there, and you get a "normal" A chord. Just a simple 2-chord song, where I play a D and a G and they sound as E and A because of the capo. This is flavored with classical guitar and fiddle tunes, and was written in 1982. Played in D position, it uses some of the cascading harp-like scales (Part 3 of this Suite uses a lot of this technique) and shows how you can play quick melodies in the treble, with supporting chords, and also move some bass lines. The ability to play baroque-style counterpoint, with a ringing drone sound (also without a loss of tone from the slack strings) of an open tuning is one of the striking features of the partial capo. "Suite in F: Part 1"
The first serious composition for the Esus capo. I originally used a Third Hand on this. A re-recording is on the Solo Guitar Sketchbook CD That version was remastered and re-released in Nov 2010 on Capo Voodoo: Solo Guitar CD. A transcription is in the Sleight of Hand book. A very clever way to play minor-key slide. Tune the guitar to an Am chord (actually an Abm) and then you capo 5 of the strings, and since the musical 3rd of the chord is on the B string, not capoing it allows the open strings to sound an Am chord. But every time you put the slide down above the capo, it makes a major chord! I can't believe more slide (and dobro) players have not stolen this idea from me in over 30 years. This is the long-out-of-print original version from the LP. The first cut on my first album used an unusual partial capo that I still don't think anyone else has done. A re-recording is on the Solo Guitar Sketchbook CD. (Remastered and re-released in Nov 2010 on Capo Voodoo: Solo Guitar CD. A transcription of this has been in my Sleight of Hand book since 1983. It is lovely and not that hard. (Remastered and re-released in Nov 2010 on Capo Voodoo: Solo Guitar CD. Because of this, I now never go to a gig without a Woodie's G-Band Model 1 capo. 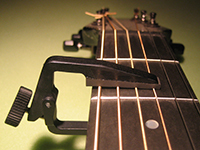 I'm a much better fingerpicker than a flatpicker, but this proves that partial capos have value for bluegrass. (This is largely cross-picked, done with a Herco heavy nylon flatpick.) You play in C position (and sound in D), so the chords you play are just C, F and G. The top 4 strings play normally, but when the song goes to the 5 chord (feels like G, sounds like A) where it spends a lot of time, you've got an open tuning on the bottom 5 strings, which you can really hear working. I recorded this with a Third Hand, but it's easier to see what is happening with the Kyser "Drop D" capo in the photo. People who play old-fashioned blues are probably not adventurous enough to try this, but it lets you get the sound of an open tuning and play slide in A by only re-tuning one string. You drop the high E down to D, then the capo makes the open strings play an A major chord. When you play the bottom 5 strings, it feels like standard tuning, but when you play the top 4, it feels like Open A. A very quick, and easy-to adapt-to way to play slide blues in A.
I recorded this with a sawed-off Shubb, but it works on most guitars with the c8b (pictured) which is designed to clamp 5 strings. (Remastered and re-released in Nov 2010 on Capo Voodoo: Solo Guitar CD. This was the first year I toured with my Taylor 810 guitar, which intonated beautifully and played like butter. I worked up a bunch of fancy fingerpicking things like this, including a transcription of Pierre Bensusan's lovely Flax in Bloom, which he of course did in DADGAD tuning. I remember learning it both ways and deciding that it was easier with the Esus capo. In Esus, you get the scales from standard tuning, the drone of the open strings, and the bass notes you need are usually nearby. I have been using A suspended capo configuration since 1980 when I first thought of it, and this is the first track I recorded with it. I am now telling the world about it, since a lot of players have had a lot of years to find all the things to do with their Esus, 3-string capos. (They all missed this one, and it is one of the very best. My Capo Voodoo Book shows a lot more clever ways to use an Esus capo.) You capo an A chord, then tune the B string up to C. It's a litte hard to get used to, and it's probably for "better players" but this song is not hard. I didn't solo because they were done by other instruments later. I recorded this track and then Anne Dodson and Matt Szostak added vocals, penny whistle and hurdy gurdy for the finished recording. This is just my solo track, so you can really hear the capo working. I re-released this track in 1995 on Artistry of the 6-String Banjo, and then it got re-mastered in 2009. There is a video on YouTube of me playing it. I started Woodpecker Records in Palo Alto CA in 1982. WIndham Hill Records was next to me in the phone book, and was also a 1-man label with a single LP of solo guitar music. (Will Ackerman) They took off and sold millions of records, and in the early 1980's I made a bunch of improvised home recordings of dreamy "noodling" fingerpicking to show that I knew how to do that new age stuff too.I never did anything with any of the tracks except grumble. I used a 1967 Gibson B-45 12-string on this track I just sold. I have no idea how I played this piece. This remains the only piece I ever recorded in the A9 sawed-off capo, and shows that I was using this configuration decades before anyone else. The guitar is tuned down 3 frets so it sounds in F#.